I really shoulda known better. I was determined that I would do a big batch cooking session on Wednesday, no matter what else came up. I desperately needed to feed the freezer. On Monday, I had gotten some chicken ‘crocodile’ nuggets put up and started some stock from the chicken bones. I wanted to add more to the stash. It started thirty minutes after breakfast when I heard a small ‘I’m hungry’ from my 7-year old little guy doing his schoolwork. He wasn’t bored or unengaged, he was quite happy with his lesson- it was his favorite subject. I was eyeball deep in a batch cooking train of thought and I ignored the potential intent behind that request. I had a one track mind. To the kitchen I went and started cooking. He wrapped up his lesson, came running and stuck his face in my pot. “Whatcha’ cookin,’ Mama?” I explained that I was batch cooking sloppy joes and that he should go finish his school work, but it would be ready in time for lunch. He raided the fruit bowl and headed back to his work. I should have noticed that red, waving flag, but I somehow missed it. “I’m hungry!” He dished up another plate big enough to choke a mule. I let him go. He sat back down and he ate. Eventually, he turned the food vacuum off, pushed back from the table and put his dishes away. I took one look at him and insisted he go put on elastic-waist pajama pants for fear he’d put someone’s eye out once the button on his pants blew from the pressure. It wasn’t ‘if,’ it was ‘when.’ He donned his Superman pajamas and we continued our day. “Surely not!! Are you stuffing it in your toes?! ?” He went another round. It hit me- growth spurt. I began to fear for my freezer stash, the contents of his closet and my wallet, all at once. I trudged to the kitchen and set out another pound of ground beef and started more lentils soaking. I’d be repeating the cooking session on Thursday, like it or not, if I wanted anything with which to feed the freezer. Thursday he sucked down a huge amount of breakfast casserole, some fruit, beefy baked beans and masa cornbread, a smoothie and a chicken dish with reckless abandon. I managed to keep the second session of sloppy joes safe. Today, his Hoover routine continues. I’m scared to see how much he’ll grow this time. 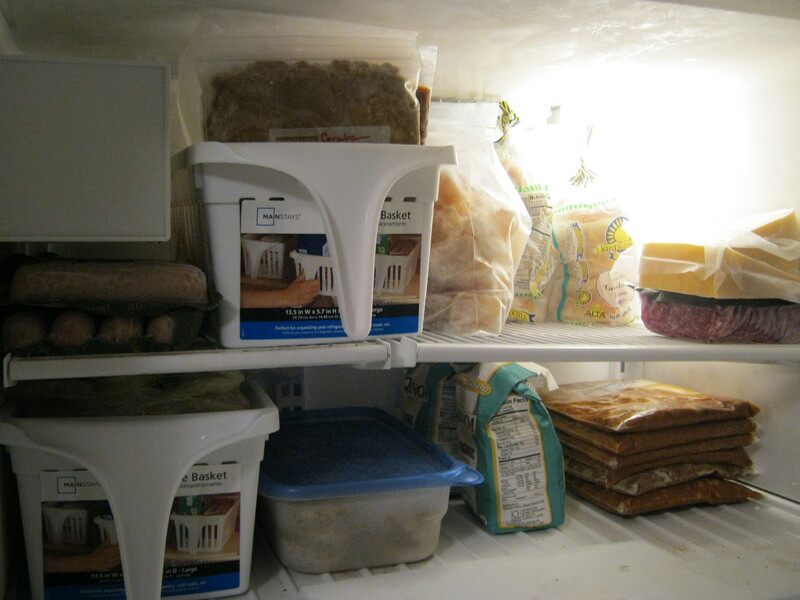 So this week I put up three meal’s worth of crocodile nuggets (in the blue-lidded container), six meals of sloppy joes (stacked in bags, bottom right) and more chicken stock concentrated down and frozen into cubes (bag, center top). We got a few packs of our favorite chicken sausages on sale. We also added some Beyond Organic ground beef and raw milk cheese to the freezer- I used some of the Beyond Organic beef to make the sloppy joes. We used the salmon and one package of the bread. Someone gave us two pounds of quinoa flour. I’m still debating what to do with it. Here’s how the freezer looks now. The gum-covered sweatpants are gone. I accomplished something important this week. I didn’t add any more snacks to the top basket and we used some of the items out of the odds and ends basket this week. I still have to get more baskets. They were sold out last I checked, I assume from everyone in an organizing fit brought on by New Year’s. Because we are going through unemployment again, stretching the quality meats we consume is important. Grass-fed meat is the most expensive thing we consume. So my sloppy joes contain cabbage, carrots, celery and lentils along with some liver and the meat. It is nutritious and it stretches the meal. We all feel better when we get some meat at each meal, even just a small amount. If I don’t eat some meat, I feel hungry again after a couple of hours, no matter how much fat I consume or the total volume of food. My apologies for the pic. No good way to make sloppy joes look great without sunshine outside so I can snap a nice looking pic. I use a food processor to reduce the carrot, celery and cabbage into extremely tiny bits. In a bowl, combine the lentils, water and vinegar. Soak overnight or up to 10 hours. Drain, rinse thoroughly. In a saucepan, combine the drained and rinsed lentils, the stock and the Concentrace. Bring to a boil, reduce to low, cover and cook until completely tender, about 18-20 minutes. DO NOT DRAIN. Meanwhile, in a large skillet, heat the coconut oil over medium heat. Cook the cabbage, onion, celery and carrot until it is completely soft, about 15 minutes, stirring occasionally. Add ground beef and liver and brown until meat is no longer pink. Drain if needed. 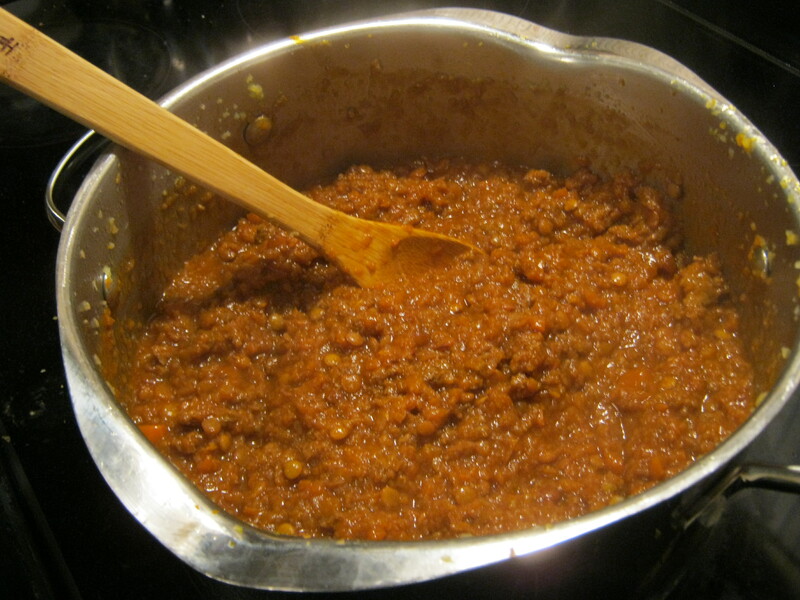 Stir in the undrained lentils, ketchup, rapadura, lemon juice, vinegar, Worcestershire sauce, mustard, salt and pepper. Cover and simmer for 10 minutes or until cabbage is completely tender. Simmer longer if you like a thicker sauce. Mmmm this actually sounds pretty good! The only sloppy joes I ever had were out of a can. Bleh. Becca C recently posted..Today’s the day! This scares me… my little guy is only 4 and he can already out-eat his 6 yo sister and I. I didn’t know it got worse even before 10-12 years old!! Very cool recipe though, it looks to become my new standard sloppy joe recipe. Thank you! KerryAnn – Your story reminds me of my years as a kid, growing up with a sister and four brothers. Heart appetites, especially the boys. My budget frazzled mom worked hard to keep our bellies full. It was typical to see a plate of regular whole wheat bread, plus butter and jam, on the table to “fill in the empty spaces” at the end of the meal. I love sloppy joe’s! I’ll definitely be stashing some away in my freezer! My husband’s been doing a lot of juicing lately, and I bet the leftover veggie pulp would be a great hidden addition! Sarah recently posted..What is TBHQ? I assume you store your sloppy joes in freezer bags to save on freezer space, but how do you defrost them? How much do you put in each bag? Do you put them in the fridge to thaw the night before? Your website is so great! I really appreciate the helpful information!